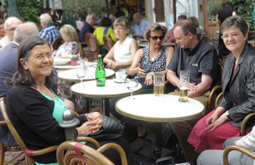 Welcome to the 11th issue of the ChemPubSoc Europe newsletter. Please read and enjoy! 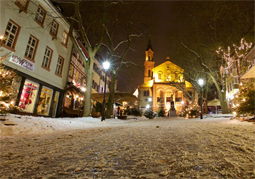 Weinheim market square, January 2015. What's the Impact of Unboiling an Egg? Since 2014, Alternative Metrics have made it easy to track mentions of published articles. 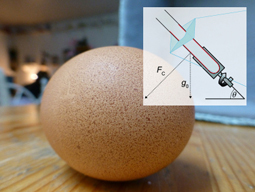 Prizes, such as the Ig Nobel Prize awarded in September to chemists at UC Irvine and Flinders University, Adelaide, on unboiling an egg (published in ChemPubSoc Europe journal, ChemBioChem  in January 2015) indicate an impact beyond mere citations. Find out the details of this new Altmetric statistic. A small chemical society lives from its young, dynamic members – Read more about how the Sociedade Portuguesa de Química, under the presidency of Maria José Calhorda, fulfills its role in Portugal. 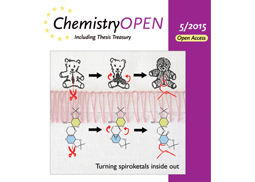 Articles in ChemPubSoc Europe journals are now published much faster. For example, the flagship journals Chemistry–A European Journal and European Journal of Organic Chemistry reduced their publication times by about 30% within the last two years. 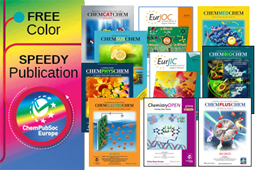 In 2016, all color will be free for articles published in EurJIC, EurJOC, ChemBioChem, ChemPhysChem, ChemMedChem, ChemSusChem, ChemCatChem, ChemPlusChem, ChemistryOpen, and ChemElectroChem. Select strong colors for clear presentation! Here are some tips how to improve your graphics. For advocates of open access, ChemistryOpen (Impact Factor: 3.250, 2014 JCR) is an ideal medium for your research papers. All articles are open access, free to all readers. As a member of a ChemPubSoc Europe society, you are entitled to a 20% discount on the associated article publication charges. Angewandte Chemie mobile edition on iPad has many fans. Angewandte Chemie is a journal of the Gesellschaft Deutscher Chemiker (GDCh, German Chemical Society). This sister to the ChemPubSoc Europe journals pioneered this entirely new browsing and reading experience on your Android smartphone or tablet. 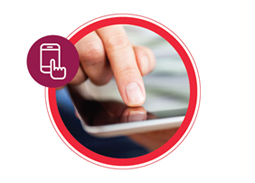 Check here when your favorite ChemPubSoc Europe journal app for Android devices will follow. They are coming soon. 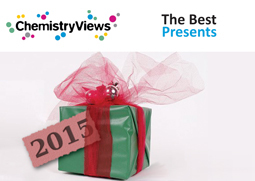 Looking for Presents with a Scientific Flavor? Still searching for a gift as Christmas present or for your friend's next birthday present? Editors recommend gift ideas. You are cordially invited to celebrate 20 years of Chemistry–A European Journal and 10 years of Chemistry–An Asian Journal at Pacifichem 2015! Meet the editors of many ChemPubSoc Europe journals in Honolulu. As a sponsor of the Pacifichem Symposium #76 entitled "Molecular Catalysis of Water Splitting Reactions", ChemPlusChem is highlighting contributions associated with this meeting in a Special Issue. Gary Brudvig, Joost Reek, Ken Sakai, Leone Spiccia, and Licheng Sun will act as guest editors. Submit your best multidisciplinary work by April 30th, 2016.